The Year of Los Merengues? It’s time for that split decision again. Sometimes you would be as well just flipping a coin to decide as the difference is minimal. Despite having 20 teams, La Liga will be won by either Barcelona or Real Madrid this season. Again. The remaining 18 teams are simply competing for positions 3 – 20. Atleti may harbour ambitions of breaking this duopoly but their squad is still someway short of a successful season long challenge. With regard to the remaining teams, there is no credible challenger in sight. So pick up that coin and flip it. Or are things not quite as tight between the big two as some would have you believe? Is there actually a gap developing between the sides? And one that becomes more apparent as the clock ticks down to the start of the season? If I were a betting man, my money this season would be on Real Madrid to reclaim the La Liga title. Why? Stepping into the managerial cauldron that is the Santiago Bernabeu is Carlo Ancelotti. Whilst replacing Mourinho has proven to be a tough challenge elsewhere, the limited success that the Portuguese enjoyed in Madrid coupled with the fractious nature of his final season means the Italian may find a hospitable reception awaits him. Combine this with his much easier going demeanour and the dressing room wounds of last season are likely to heal over quickly. A key attribute of Ancelotti has always been his ability to squeeze major players into his starting line up often in an effort to satisfy the demands of overbearing Presidents. At Milan, Chelsea and PSG, Ancelotti has succeeded in shoe horning a number of seemingly incompatible players into his starting eleven. To accomplish this successfully, altering his tactical set up has become a necessity. The Italian has used the 4-3-2-1, 4-4-2 and 4-3-3 although interestingly, he has seldom used the 4-2-3-1 which was the default starting line up for Madrid under Mourinho. 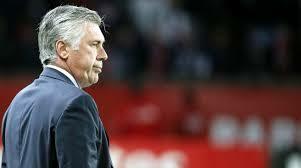 More of the same or a departure for Ancelotti? Pragmatism and the lack of adherence to a particular system are his strengths. He will assess the players at his disposal and design a system around their skills. In that respect, Ancelotti is not your typical Italian coach who is married to one system. His versatility and flexibility will aid a Madrid side that became increasingly one-dimensional last season. Opponents knew how to close Madrid off. They were a reactive, counter attacking side. In truth, not that dissimilar to the PSG side that Ancelotti was building. At Madrid though with greater resources at his disposal, Ancelotti will construct wisely. With league titles from Italy, England and France, who would bet against Ancelotti adding Spain to that list? This brings us to how Ancelotti will shape Madrid up this coming season. Ancelotti has utilised the 4-3-2-1 Christmas tree formation in pre season and is known to favour this formation but his versatility has enabled him to deploy various formations over the years to maximise the players at his disposal. Assuming that Ancelotti does decide to primarily use the 4-3-2-1 formation, one of the key questions would appear to be the deployment of Ronaldo. If Madrid acquires Gareth Bale, it wouldn’t be to play him at left back which would mean a position behind the sole striker. This would surely mean Ronaldo as the no9 to avoid conflict between the two. Even if Bale does not arrive, serious consideration must be given to Ronaldo being the striker. Alternatives at the moment for the striking role remain Benzema, Morata and Jese should he be elevated from the B team. Yet given his goal scoring ability in Madrid with 201 goals in just 199 appearances, it makes sense from an attacking perspective to place Ronaldo at the tip of the tree. Could Ronaldo outscore Messi if he is given the opportunity of being the central attacking player? It also makes sense from a defensive perspective too with Ronaldo frequently failing to undertake defensive duties and leaving his left back exposed when he has been deployed on the wide left position, a matter that has been capitalised upon by opponents most notably Borussia Dortmund in the Champions League semi final in April. Further back, the midfield trio can incorporate two holders and a more creative force. The burden upon Xabi Alonso to build and create from deep should be eased and Madrid can become a more fluid side as a consequence. Width can be provided by Di Maria operating from a deeper starting position or by the full backs safe in the knowledge that there is a strong platform behind them to compensate when they push forward. The basis for the greater tactical options now open to Madrid is also partly attributable to the quality and depth of the squad. The squad has seen the departures of Callejon, Albiol and Higuain. The loss of Albiol and Callejon who both had very limited playing time last season will not be missed but both the goals and assists that Higuain provided could be more of an issue particularly as it leaves just three players for the striking role in Benzema, Ronaldo and Morata. The squad is strong and could become even more so if the proposed acquisition of Gareth Bale proceeds as Madrid clearly want it to. It’s not a necessary signing though. Even without Bale, Madrid is strong throughout their squad. Cast your eyes across the squad and you see position after position has quality and alternative options available. Who will start the season in goal, Casillas or Diego Lopez? There is Carvajal or Arbeloa for right back whilst Marcelo and Coentrao will do battle for the left back slot. Only really in central defence could there be a slight weakness with perhaps one more centre back being required to provide cover for Ramos, Varane and Pepe. In midfield there is Alonso, Khedira, Modric, Ozil, Isco, Illarramendi and Di Maria all challenging for positions. The strong has genuine quality throughout and gradually now shows a stronger Spanish core too. Quality and identity now exists. In a surprising turn of events, Madrid is the side showing foresight and vision in their transfer policy with the acquisition of Carvajal, Isco and Illarramendi. Three members of the Spanish U21 side that just defended their European crown and potentially members of the Spain squad that travels to Brazil next year have joined their ranks. That three young Spanish players have been acquired signals an intent by Madrid to secure a core set of Spanish players over the longer term. A set of players who will form the heart of both Madrid and potentially the Spanish national side for years to come. It’s also about buying players who shone for the respective clubs last season within a system. Madrid has been a club that relies upon individual talent over the team but these signings indicate a tempering of that philosophy. Isco – The Future Part 1? The fourth member of that victorious U21 side is already in the first team squad. Alvaro Morata continues to impress and will surely be granted valuable playing time this season to hone his skills. Will the names of Carvajal, Illarramendi, Isco and Morata soon be known for their exploits with both los blancos and la roja? This optimism should be considered cautiously though. It wasn’t that long ago that Madrid were signing the likes of Canales only to use him sparingly and effectively stall the players career during a key development phase. The same mistakes must not be repeated. Illarramendi – The Future Part 2? And this brings us neatly to the problems facing Barcelona. Whilst Madrid strengthens, their rivals appear to be caught in the headlights. They have already sold David Villa and Thiago and speculation continues to surround Fabregas. Somebody, somewhere in the whole Fabregas scenario is not telling the whole truth and the debacle rumbles on. Meanwhile, the circus of their failure to strengthen their defensive position continues. It’s unlikely that Puyol will last another full season without either succumbing to another injury or substantial rest and rotation. Bartra has been given limited first team exposure to date and add to this the departure of Abidal and the defensive fragility becomes clear. The arrival of Gerardo Martino as coach should see a strengthening of the defensive unit but reinforcements are a necessity and not a luxury. It’s not just one centre back Barcelona needs, it’s two. Martino must also address the structural problems that Barcelona experienced last season. The player who could enable Xavi to rest has been sold to Bayern Munich. Barcelona has to regain that freshness, the intensity to their game that has faded and gain a greater element of thrust and verticality to their attacking play. The acquisition of Neymar could prove to be an excellent signing but it was in an area of the team not needing surgery. Are Barcelona falling victim to the cult of the galactico as Madrid demonstrate a commitment to younger players. Whilst Barcelona sits and fails to resolve problems, Madrid strengthens. The negativity that engulfed Madrid as the Mourinho era came to a close will be eradicated with the arrival of Ancelotti at the helm. Harmony and balance can be restored both on and off the pitch. The balance of power is shifting once more. The title is heading back to Madrid.